....it's a representation of my thoughts and feelings shown on a screen, composed of pixels and magic (probably). 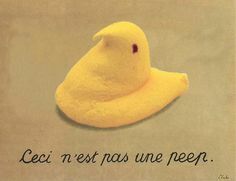 I'm sure this is what Magritte meant to say. Creativity is difficult for me. As much as I love research and scholarly writing, I'm not a creative writer, and I'm sure I've said that before, and I didn't feel comfortable sharing my writing in the last class. Although we didn't get to take the bus to Australia, it was cool to participate in the activity along with the UOW students. It's interesting to see how people can form perceptions of a place just from the website, and it's even more interesting to see how the perceptions stand up to the voice of experience. One of the biggest things I noticed on the UOW site was the noticeable lack of a "Student Activities" page. In the U.S., one of the main things that students look for in a college is the college experience, shown by the clubs and Greek life options that are advertised on the site. In some ways, the experience is as important as the learning (for better or for worse). However, from the students responses to "What UOW is Really Like," it seems like a pretty normal campus! It's hard for me to speak on Kean, because I commute to campus. I've spent a very limited time anywhere except the classrooms and the Writing Studies office. However, I do spent time around other students and I know some of the intricacies that have jaded people against the school-- as well as some of the benefits students enjoy. For that reason, it's funny to look at our website while being a student-- it's impossible to be unbiased. You might be able to get a feeling for a campus's vibe, but it's impossible to average out the "general" experience of all students. Everyone is different and everyone values different things. For me, this school works because it's affordable, close, and will get me where I want to go. Yes, there are roadblocks and red tape, but it works for me. This is not going to be everyone's story. Even Princeton could be one student's heaven on earth, and another's hell. As for "world building," wow, that's a hot topic if I've ever heard one. When we build a world (and yes, I'm thinking about Minecraft), we build it around the things we need to survive. When I start a new game in Minecraft, the first thing I do is build a hut to protect me from the monsters at night. Then, when day comes, I venture out and see where the resources are. When I find water, I build a new house. When I find trees, I store up wood. Then, I go from there. We all need basics to get through the day. We all need food, water, and oxygen to sustain our basic needs. From that point, we're all different individuals with different experiences in this mad world. In our individual searches for truth we find different answers, many of which set us against one another due to conflicting answers to the same questions. In short, I don't think we can pull out the story threads to find the "master narrative," because not everyone believes in the same master narrative (or one at all, for that matter). I can tell you that Christianity is the master narrative I accept, and you may or may not accept it based on your mind and experience. But, that's what my story is based on-- that's my master narrative and all of the answers I'm going to find will be based on that narrative. Wherever you find your truth, you find your narrative. So, netnarr, what is truth? Some compartments warm the heart with love. full of memories yet still sensitive. Those are the memories that ache. punctuated like a dotted line. Those are the compartments from which I hide. Those are the doors tightest closed. Well, NetNarr friends, I tried. I tried so hard to accomplish the #soundwork challenge, but audio editing doesn't seem to be my forte! I attempted the "Have A Conversation With Yourself" challenge, and decided to read a excerpt from The Little Prince-- I thought it would be cool to put different voices to difference characters, as well as the narrator. My sound clip was less than 40 seconds, it seemed simple enough! Sadly....it was not, but I tried, and I think I could work around Audacity if I needed to, which is the point, r-right? Note: I'm not entirely sure why the image behind my excerpt is a giant version of my profile pic but, well, hello! I worked on this for longer than I'd care to admit, and the main thing I learned is that the natural voice fluctuates quite a bit. I played around with pitch, and came to realize that it's not enough to adjust the end result pitch, in order for segments throughout the clip to blend well, the starting pitch needs to be consistent. This got quite confusing after a while and, even when I thought I had a smooth transition, it wasn't necessarily so. I chose this particular exercise because I thought it would be the simplest to grasp, considering how new I am to audio editing. Turns out, there's quite a learning curve, even for the exercise I thought would be simplest. However, this is what I enjoy about this class, it's always some new challenge. Now, I can come away saying I've played around with audio editing software. You can click here be linked to my #3soundstory, which is the story of a pretty normal morning in my life. It was interesting to click through the sound sets posted in the portal and listen to other people's morning sounds. I also want to comment on our bus tour to the Young Writers Project. As I browsed through the site, I was stunned by the talent and courage shown by the the participants, especially considering their ages. It takes a great deal of strength and confidence to submit your work to the public for anyone to see and review. Not a lot of people have this courage, and I am impressed that these kids have taken the leap. Kids are crucially important to society, and I have always believed that we should listen to their voices. The events that shape a person in their formative years have a huge impact on who they grow up to become. Writing may be the best thing kids can do to work through the intense emotions and thoughts that accompany growing up-- the first heartbreak, family trouble, loneliness, questioning-- these things are all important. During my adventure through the site I saw stories, both fiction and nonfiction, that spoke to me because they indicated an incredible degree of depth and knowledge. I realize I'm waxing a bit Wordsworthian (à la "the child is father of the man") but I think there's a relatable degree of truth to be found in the comparison. If I could leave the writers of the Young Writers Project with one thought, it would be this- keep writing. Do not stop. Do not lose interest in your writing, and do not fall into the lie that it's not good enough, or can't compare to the greats. In expressing yourself, you are doing the world a service, and you will help at least one other person out there who thought they were all along. To drop another name, in the words of C.S. Lewis, "Friendship...is born at the moment when one man says to another "What! You too? I thought that no one but myself..."